"Thanks for the information on removing the meat from the lobster. I wanted to ... read full review"
A utensil that is used to crack open the hard-shelled claws and other parts of a lobster in order to access areas containing meat. 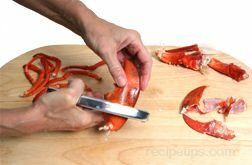 This tool is typically formed to the shape of the lobster claw and legs in order to easily grasp the hard surfaced area. 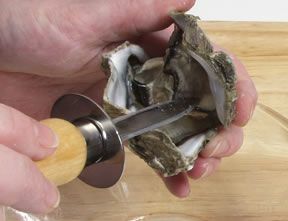 It is also a utensil that works well when trying to remove meat from crabs or other similar shellfish. An all purpose kitchen knife that is used for most types of chopping, dicing and slicing. The heft, weight and balance of this knife allow it to be used for heavy duty work with thicker cuts of vegetables, fruits and meats. This knife may also be referred to as a French knife. 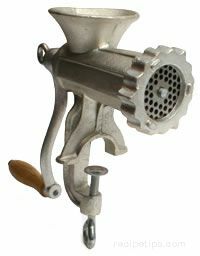 A utensil that is used to remove meat from the small cavities and areas that are difficult to reach within a whole lobster. This tool is generally made of stainless steel and may have one or two ends that are formed for use as a fork, pick, and narrow spoon-shaped extractor. A lobster pick or lobster fork as it is also called, can be used for other shell fish, such as crab and crayfish. When selecting lobster to prepare at home, there are several details to keep in mind to help you select good quality lobster. See the information below to help make the best selection. The lobster should still be fairly aggressive when handled. Before the lobster is picked up the tail should be straight. When picked up the tail should curl under. Also, if you force the tail to straighten out while holding the lobster, it should curl back quickly when let go. Be sure the claws have been banded for your protection. The lobster should have a fresh smell. Be sure the lobster has both claws and they should not be damaged. If missing a claw, be sure the price has been discounted. Holes or black marks on the shell of the lobster indicate wear and tear, indicating the lobster is more mature and has not recently shed its shell but does not indicate that there is anything wrong with the lobster. Harder shells on the lobster will generally mean that they contain more meat because they have fully grown into their shell. You will get more meat but it will also be harder to get at because of the hard shell. Softer shell lobsters indicate the shell is newer on the lobster so it is still growing into its shell. 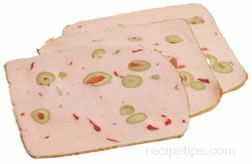 The meat is easier to get at because of the softer shell and it is thought by many that the meat is more tender and sweeter in taste. The lobster should not show signs of discoloration, especially in the joints. The lobster's claws should be intact and not be damaged. Look for discoloration of the meat, such as black spots, which are an indication that the lobster was mishandled. The meat on the frozen tail should be white. A grayish tint indicates that the lobster was not alive when going through the freezing process. This will result in a lower quality product. Note: There are two types of lobster, cold-water and warm-water. Cold-water lobster comes from Australia, New Zealand and South Africa. Warm-water lobsters come from Florida, the Caribbean and Latin America. Cold-water lobster has whiter meat that is firm but tender. The warm-water lobster meat can at times be less firm and not as good quality. Cold-water lobster is generally more expensive but may be worth it to ensure a quality product. 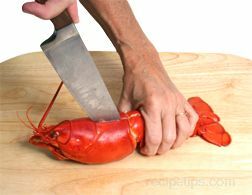 The lobster should be cooked before removing the meat. See the instructions below for information on how to remove the meat from the lobster. Grasp the body of the lobster firmly in one hand and the claw in the other. Twist the claw and pull from the body of the lobster. Twist off all the legs from both sides of the body. Set legs aside to clean later. Break the claw into three sections. 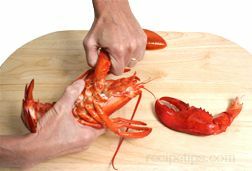 Hold on to the claw and pull down on the pincer to remove it from the claw, and twist the lower section at the joint to remove it. Crack open the claw to remove the meat. 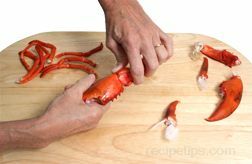 Use a mallet or rolling pin to break the claw or use a lobster cracker to break it open. Try not to break into the claw so hard that it tears the meat inside. Break just enough off the claw to be able to get a good hold of the meat. 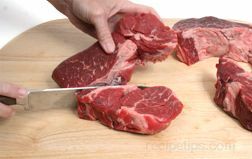 Pull carefully on the meat and the whole section should come out. 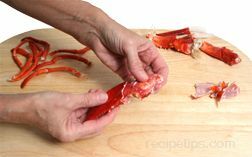 Carefully crack open the pincer and the lower section of the claw. 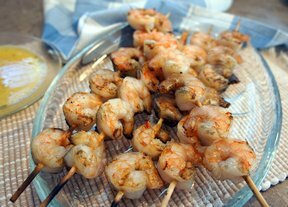 Because the lower section and pincer are smaller, the meat may not come out as easily. It may have to be removed in pieces. 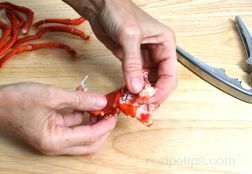 A lobster pick may be useful when trying to remove the meat from the smaller parts and the legs. 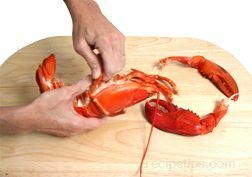 To remove the meat from the tail, begin by placing the lobster right side up on a cutting board. 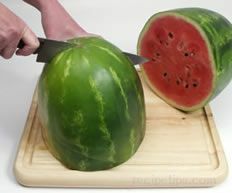 Holding the head in one hand, insert the tip of the knife into the middle of the body beginning at the seam between its head and body. Cut all the way through lengthwise down its body and through its tail. Turn the lobster around and hold firmly onto its tail. Finish cutting lengthwise through the head to cut entirely in half. 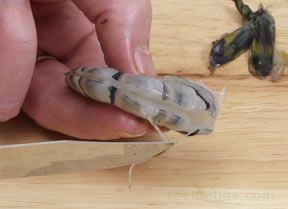 Remove the stomach sac and feathergills from the head and discard. Find the grayish black intestinal thread that runs down the tail and remove it. 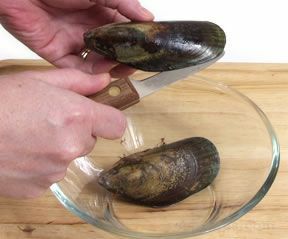 The tail halves can now be grilled or broiled in the shell or the meat can be remove and prepared in other dishes. 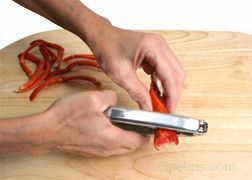 To remove the meat from the tail, loosen the meat with fingers and pull it out in one whole section. If possible, cook live lobster immediately. If it is not possible, store in the refrigerator. 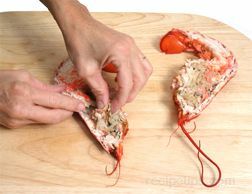 Cover the lobster with wet newspaper or a damp dish towel and place in an UNCOVERED container. If stored covered in an airtight container, the lobster will suffocate. Store in the coldest are of the refrigerator, which is generally in the back of the top shelf. Cook within 24 to 36 hours. Place cooked lobster in an airtight container and place in the refrigerator. Cooked lobster stored in the shell can be stored in the refrigerator for 2 to 3 days. Cooked lobster meat that is removed from the shell can be stored in the refrigerator for up to 4 days. Uncooked Lobster - For the best quality lobster, freeze uncooked. Place lobster in a freezer safe container or bag, or wrap tightly in freezer paper. Remove as much air from whatever type of storage packaging is used. Label the package with contents and date, and place in the freezer as soon as possible. 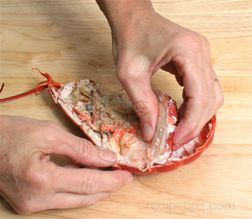 Cooked Lobster (in the Shell) - Cook lobster, drain, and allow to cool. Place in a freezer bag, squeeze out all excess air and seal tightly. Label the package with contents and date, and place in the freezer as soon as possible. Note: If desired, the lobster tail can be removed and frozen just on its own. If the lobster has large claws that would contain a fair amount of meat, also detach them and freeze with the tail. 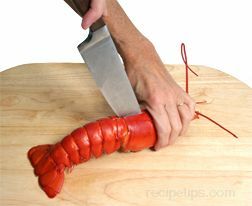 Cooked Lobster (Meat Removed from Shell) - Cook lobster, drain, and allow to cool. 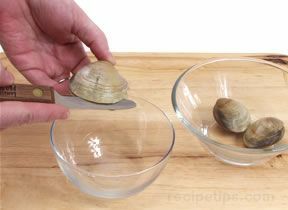 Remove meat from the shell. Mix a brine solution consisting of 2 teaspoons of salt per cup of water. Place the lobster meat into a freezer safe container or bag and cover with the brine solution, leaving 1/2 inch for headspace to allow for expansion when freezing. 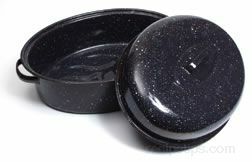 Remove any excess air and seal tightly. Place in freezer immediately. Lobster can be stored in the freezer for 2 to 3 months. Thaw frozen lobster in the refrigerator or under cold running water. Do not thaw at room temperature. "Thanks for the information on removing the meat from the lobster. I wanted to surprise my husband by preparing lobster for our Valentine's Day supper but once I cooked it I wasn't sure what to do with it. These detailed instructions are just what I need. Thanks again!"